Attorneys from the Southern Coalition for Social Justice, the ACLU Voting Rights Project, and the ACLU of North Carolina appeared in federal court this week to argue for a preliminary injunction that would prevent North Carolina from enforcing its voter suppression bill, H.B. 589, during the November 2014 election. The hearing included testimony from North Carolina voters who will be affected by H.B. 589 as both voters and leaders of non-partisan organizations that educate and register voters. Although the Judge has not announced when he will rule on the SCSJ and ACLU’s request for a preliminary injunction, attorneys were encouraged by the judge’s attention to the case and look forward to the ruling. Witnesses at the hearing included Melvin Montford, Executive Director of the North Carolina A. Philip Randolph Institute, Senator Dan Blue, Representative Rick Glazier, former Director of the Guilford County Board of Elections George Gilbert, and former Executive Director of the North Carolina State Board of Elections Director Gary Bartlett. 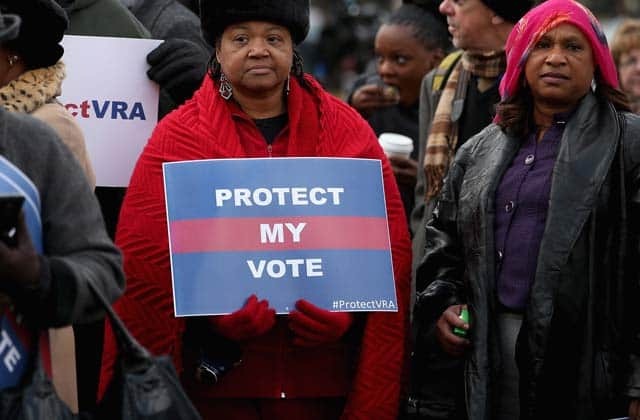 The witnesses spoke about measures enacted since 1999 that expanded opportunities for voters to cast their ballots, how those measures have increased the rate at which African-American citizens are registered to vote, and how H.B. 589, enacted through a remarkably bad legislative process, would reverse those gains. In addition to the testimony of individuals who see H.B. 589 in terms of its effect on individual voters, SCSJ and the ACLU presented evidence quantifying the benefits of the procedures that H.B. 589 eliminates or reduces. In the 2010 midterm general election, for instance, over 27,000 voters registered through the same day registration (SDR) procedure that allows voters to register and vote at the same time, and over 200,000 voters cast their ballots on early voting days that are not available under the newly shortened time for early voting. In addition to the North Carolina A. Philip Randolph Institute, SCSJ and the ACLU represent the League of Women Voters of North Carolina, North Carolina Common Cause, Unifour Onestop Collaborative, and individual voters. Joining SCSJ and the ACLU were the North Carolina State Conference of the NAACP and the United States Department of Justice, both of which have brought separate challenges to H.B. 589.